The idea of collaborating on each others' songs came by way of a dream, the Fleetwood Mac singer tells THR. 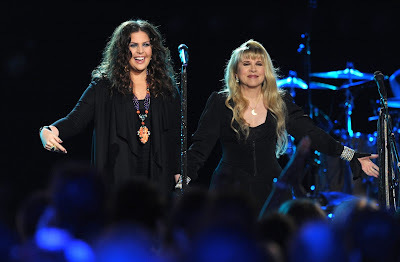 If you tune in to the new episode of CMT Crossroads, which has Stevie Nicks and Lady Antebellum as its latest cross-genre pairing, you’ll hear a version of “Rhiannon” that almost sounds more like Fleetwood Mac’s original version than Fleetwood Mac could do. Nicks didn’t think much more about this nocturnal prophecy until three days later, when she went to the premiere of a Led Zeppelin concert movie and was approached by Bill Flanagan, a longtime producer for MTV Networks specials, who asked her for the umpteenth time if she’d be willing to do a Crossroads. Much to his shock, she said she could fit it in right before rehearsal started for this year’s Fleetwood Mac tour. And before he could start listing potential names, Nicks told him about how Lady Antebellum had just popped up in her rapid-eye-movement revelation. For Lady A, it didn’t matter that Rumours came out before they were born; there wasn’t much homework required. “We didn’t have to listen -- we already knew,” says Charles Kelley, who maintains that translating Nicks’ classics from their collective memory into band recreations was a cinch. When they do Lady A’s multiple Grammy-winning smash “Need You Now,” Nicks opens the tune by duplicating the spoken-word phone call monologue that begins the original recording. The band didn’t know Nicks was going to do that, and you can see Scott cracking up over the surprise. They did a subsequent retake that nixed Nicks’ unexpected recitation, but fortunately, producers went with the first version that included Stevie going whole-hog with the song’s drunk-dialing motif. The one song they ended up doing together from Lady Antebellum’s new album, Golden, wasn’t the hit “Downtown” -- even though Nicks learned it -- but the more subdued title track. Elaborates Nicks: “I’m in my beautiful little bathroom in my condo that took me a year to complete. It’s a little white jewel box room. I’m in there and I get the song and I play it once, and I start to cry. My best friend from the 7th and 8th grade, when I lived in Salt Lake, has a daughter who has a brain tumor, and she has golden, curly hair. The song was on repeat, and it started again, and she walked in, and I just put my arms around her and held her really tight and just really sobbed for the whole four minutes of the song. Because she is golden, and I just wanted to put every bit of energy I had into this girl, because she’s facing an extremely tough battle. The Nicks/Lady A Crossroads premiered Friday, Sept. 13 on CMT, with repeats set for Saturday and Sunday (check local listings). Just watched Stevie and Lady A on the CMT Crossroads episode....BLOWN AWAY!!!! ABSOLUTELY AMAZING!!!! 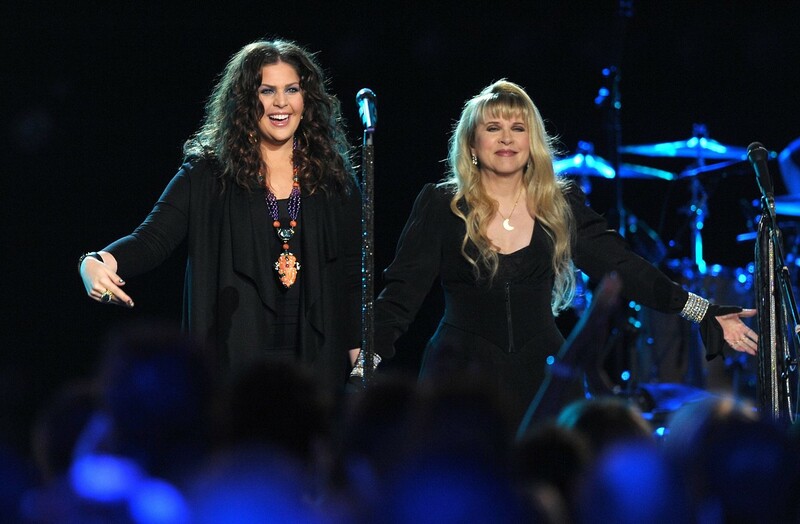 Just watched CMT Crossroads with Stevie Nicks & Lady Antebellum ... I could watch it over and over again..It was amazing !!! It's true what Stevie said in this article... this is the closest version of Rhiannon to the original version that has ever been performed... it nearly sounds like the 1975 album version... amazing to hear and amazing that Stevie freely admits that she can no longer sing those high notes! And Bravo to the editors for STARTING the show with Edge of 17 rather than putting it at the end. Please, please release the full version of this show on DVD or digital download. Some of the songs were edited and as this article explains several songs were deleted entirely from the telecast. This show is a tearjerker, a joy to watch and hear from beginning to end. BRAVO, BRAVO, BRAVO Stevie and Lady A! Yeah I totally agree with the last post I was thinking the same thing about a release of the whole show.This is a steller preformace by all people involed.This is better than a 5 stars rating> i would love to see them tour together somday in the next coupld of years that would be awesome!!! Not only did we get the original "Rhiannon," I felt the performance of "Edge..." was much closer to the album version than Stevie's done in years. I would love to know what songs were cut out for time, but then again maybe not because if we don't get a DVD I'd be upset at not having seen them. Stevie actually looked like she was having a really great time onstage. I was only familiar with a couple of Lady A's songs but after this set I actually want to go buy a couple CD's. just found more songs that did not make the cut from this show. Go to cmt offcal website crossroads with stevie golddust woman and just a kiss and cold stone videos are their. Please release DVD/CD of complete unedited version with all the songs-this was the best Crossroads ever!!! Also waiting on a DVD and CD release of the complete show. It was truly AMAZING!!! !